This is my latest favorite banana bread. 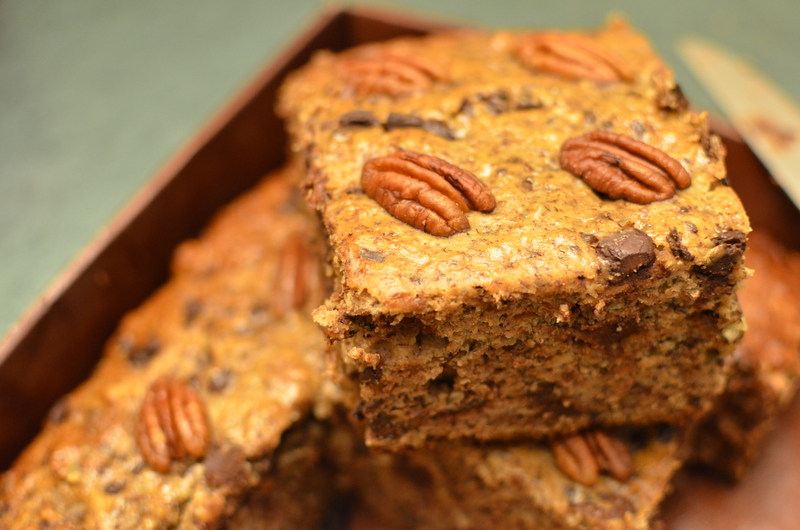 It requires less oil and healthier sugar than a lot of other typical banana bread. I think it uses less sugar because it’s loaded with 5 bananas each loaf !! Most importantly, I can still bake when I have NO EGGS in my house. It’s moist inside and crunchy on top after baking. It’s one recipe I don’t alter any ingredient except using 1/2 flour as whole wheat and choosing pecans as my nut add-on. 2. Grease & flour a 8×8 non-stick baking pan. 4. In a separate bowl, mix together wet ingredients in a food processor. 7. Pour into your pan and bake for about 45 minutes or until golden brown & a toothpick comes out clean (or covered in melted chocolate – just not batter). 8. Let cool slightly, slice & enjoy! It tastes even better the next day.